Traveling the Alberta back roads has its perks! 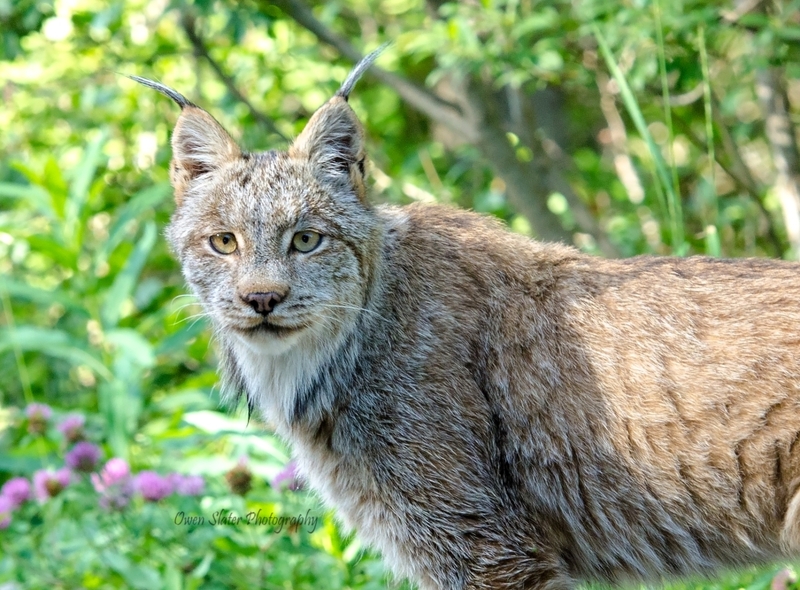 This beautiful lynx calmly strolled along the shoulder as I tried to contain my excitement long enough to get a few photos! It came within 10-15 feet of us and not once did I hear its footsteps. The only sounds were of the very concerned red squirrels high up in the trees. A grizzly bear mom takes a break from eating dandelions to play with one of her tiny cubs born earlier this year. 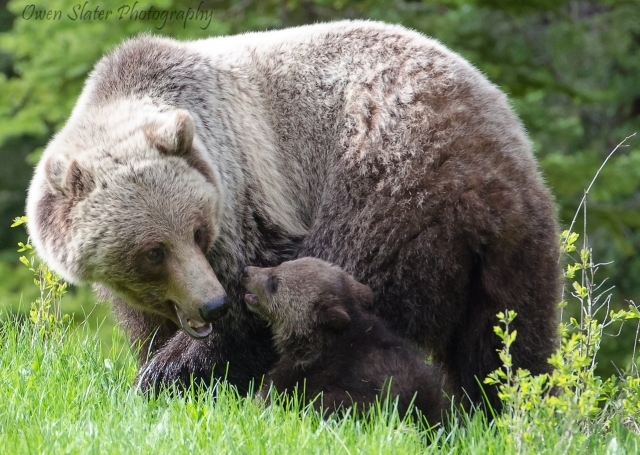 With the grizzly bear population threatened in Alberta, it’s been great to see at least three grizzly sows in the Rockies with new cubs this year. 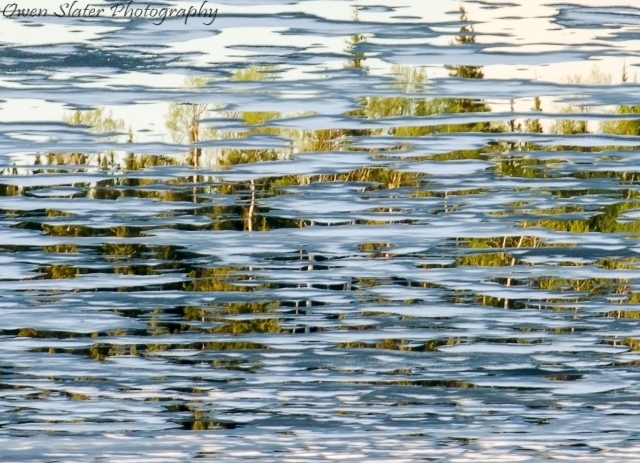 The last patches of ice and snow melt into pools of water on this Yukon lake, creating a unique reflection of the surrounding forest. If I told you that for the past few years mountain caribou have been captured by nets, sedated and loaded into helicopters and then flown to either awaiting transport trailers or large enclosures on the sides of mountains you would likely think I’m pulling your leg. I wish I was, but for the past several years dedicated teams composed of First Nations personnel, wildlife biologists, fellow veterinarians, and countless others have being doing just that in order to try to conserve some of the most critically endangered caribou herds in British Columbia. 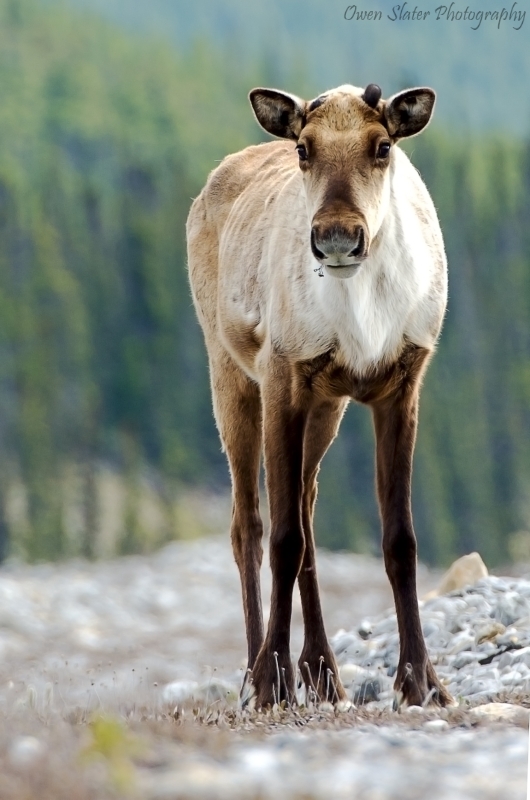 Past and current caribou conservation measures in the province include everything from limiting human access to caribou habitat, predator management and caribou translocations. Talks continue to occur to establish a captive breeding program so that there is a source population for dwindling herds, but while those plans are still in the preliminary stages other intensive caribou conservation initiatives are being implemented. The most recent includes what is termed ‘maternal penning’ of caribou. Maternal penning involves taking wild, pregnant caribou and placing them in large enclosures in their native habitat for about 3 months. During this time they are protected from predators, given lots of lichen and other high quality caribou food and provided with a safe place to give birth to their calves. Disturbances from people are kept to an absolute minimum so caribou are not conditioned to human presence. The calves are born in May-June and kept in the enclosure for the next 1-2 months until they are strong enough to easily keep up with the herd and to be able to outrun predators like wolves and bears. At this point the mothers and calves are released back into their natural habitat and monitored to track calf survival. Previous application of this technique in the Yukon showed promising results and so the technique was adapted for use in the mountainous areas of British Columbia. A few months ago maternal penning projects were undertaken for two declining herds in BC. One was in Revelstoke and another near Chetwynd. The later is a unique initiative spearheaded by the West Moberly First Nations in partnership with biologists and the provincial government. The West Moberly first nations have suspended their treaty right to hunt caribou for the past several decades and have recently used this treaty right to drive the process of caribou recovery in their native lands. They created their own caribou recovery plan that met the requirements of the Species at Risk Act, which in turn has led to the maternal penning project that was implemented earlier this spring. It is too early to say whether all of these efforts will pay off, and some may argue that the resources put into mountain caribou conservation would be better spent elsewhere. In my opinion caribou are just a symptom of much bigger problems that will need to be addressed sooner rather than later. While governments decide on what to do to combat climate change as a result of habitat destruction and pollution, those of us on the front lines will continue to try to treat the symptoms until the bigger issues are finally addressed. 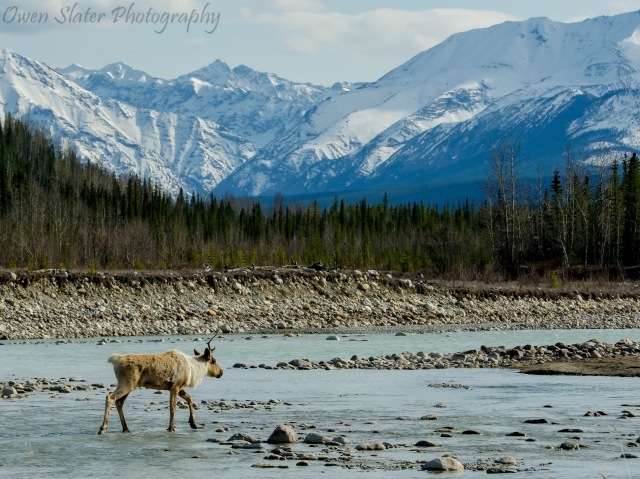 If you’re interested in learning more about mountain caribou click on the below links for additional details. Putting it mildly, mountain caribou as a whole are not doing well. Several of the southern and central mountain herds are down to less than 50 animals! In fact, these two populations were just listed as endangered by COSEWIC (Committee on the Status of Endangered Wildlife in Canada). The northern mountain population was listed as ‘special concern,’ which is one step away from threatened status. On my drive up to a conference to discuss current research on caribou I was lucky enough to come across some of these iconic animals along the way. This bull was hanging out near the border between BC and the Yukon, where many bulls were feeding on plants in the valley bottoms. Unfortunately, in the near future sightings like this may become exceedingly rare. Next week I will post on some of the intensive conservation measures being undertaken to try to save this species. I knew after I took this photo that it was going to be my favourite of him, but initially I wasn’t sure if I was going to get it. The marten was moving behind a small hill out of site and I thought he might just disappear into the bushes. But I got lucky and he came up from behind a snow bank, cocked his head back and forth and intently listened for rodents scurrying under the snow. I quickly fired off a few frames and smiled to myself knowing that I had the photo I wanted. 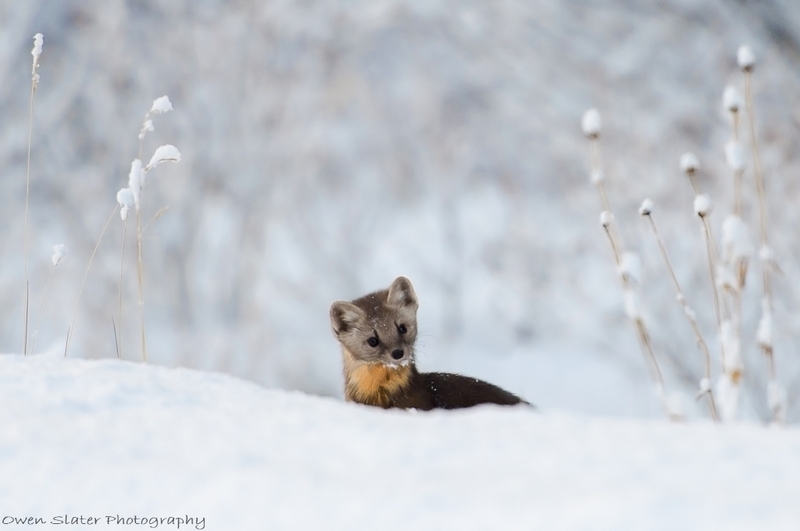 Which of the two marten photos do you like best? An adult male grizzly bear plows through 10 centimeters of snow in minus 10-15 degree Celsius temperatures. While the females and young cubs are already tucked away in their dens, these big males are still out looking for food to pack on the pounds so they can compete against the biggest males for breeding opportunities in the spring. 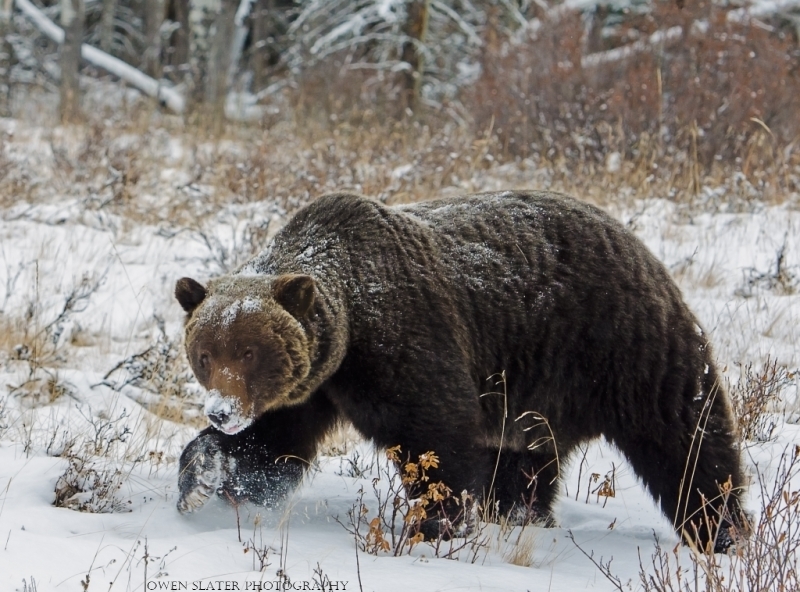 For the past several years I have tried in vain to get a good photo of a grizzly bear in snow. I have run into them as late as December, always either really early in the morning or late at night. All of that changed when this bear lumbered out of the forest in the middle of the day. 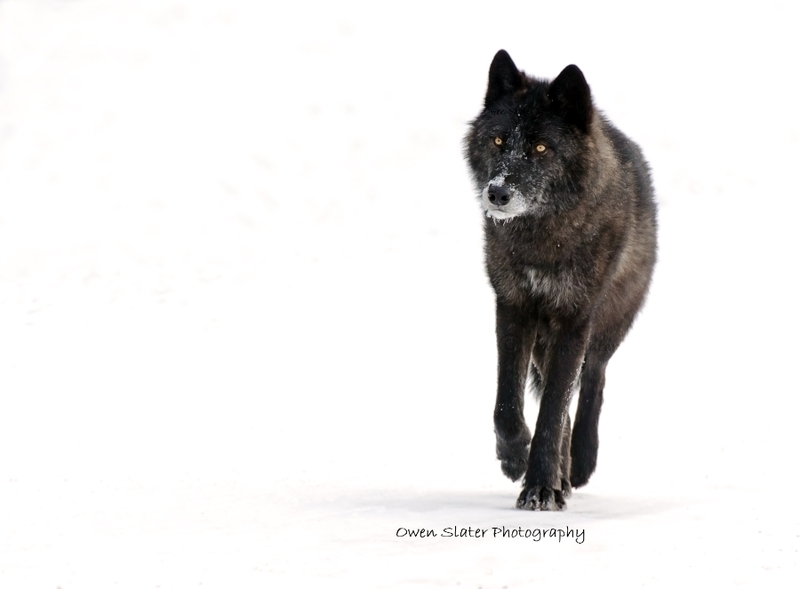 He wander back and forth following the tracks of a pack of wolves that had been in the area earlier in the morning. Most likely he was trying to determine if the wolves had made a kill. Being the biggest predators in the Rockies, they will follow wolves and steal away their kills through brute force but on this day the bear came up empty handed. With his nose covered in snow, he plodded along weaving a route back and forth through the forest before giving up and moving on. I was recently down in Utah for work, but I had just enough time to take a quick detour to visit Arches National Park. Having been there once before I wanted to try something different. 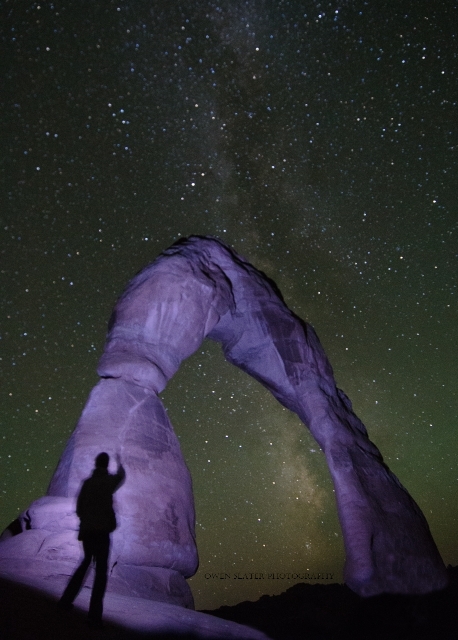 So after hiking to the famous Delicate Arch for the classic photos of it lit up by the setting sun, I stayed until after midnight to photograph it under the stars. With the help of one other photographer, the two of us used flashlights to ‘paint’ the arch in light while the other took photos. With several shooting stars and the Milky Way Galaxy shining brightly in the distance, it was a spectacular night to be out taking photos! 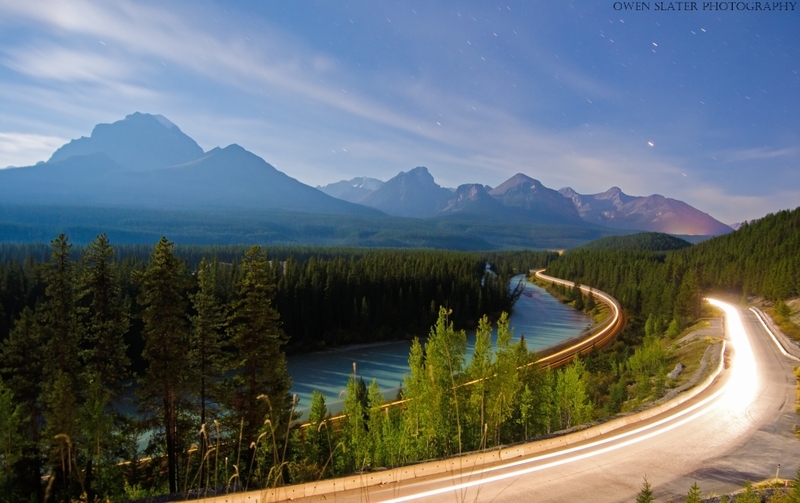 The famous Morant’s Curve on a beautiful, moonlit night in Banff National Park. I have been trying to get this photo for some time but finally all the elements came together. Under the light of the moon the colours in the Bow river and on trees were highlighted, while the brightest of the stars and the soft glow of light from Lake Louise became visible in the distance. It wasn’t hard to just sit and wait for a train that night, but I didn’t have to wait long. As it lumbered along the tracks on its approach to the curve I could see the lights of a car approaching. Was I finally going to get the lights of both in the same frame? As it rounded the curve I started the exposure and for almost a minute I held my breath hoping that I had got the settings correct. Soon I had my answer…a perfect ending to another great day in the Rockies. 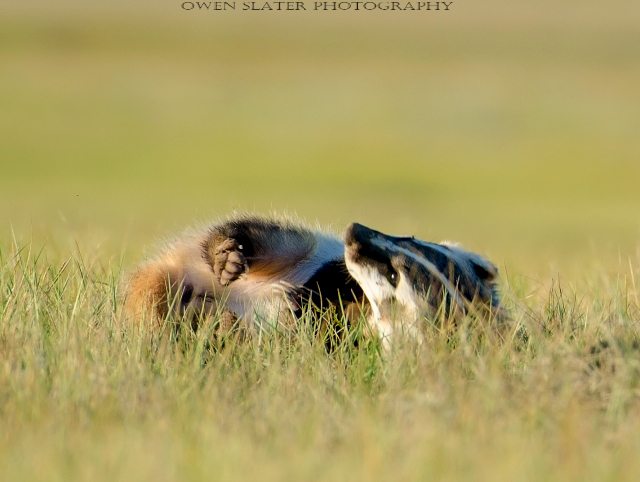 Feeling completely at ease, this young female badger played around in the grass right in front of me on another spectacular evening in Grasslands National Park. 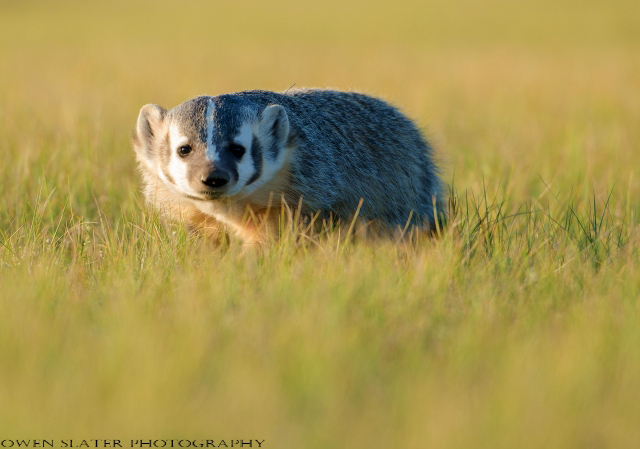 Hard not to like badgers when they are this cute! With that, my trip to Grasslands has come to an end. It was an amazing week with memories to last a lifetime. No doubt I’m sure to be back soon! Believe it or not, there are! 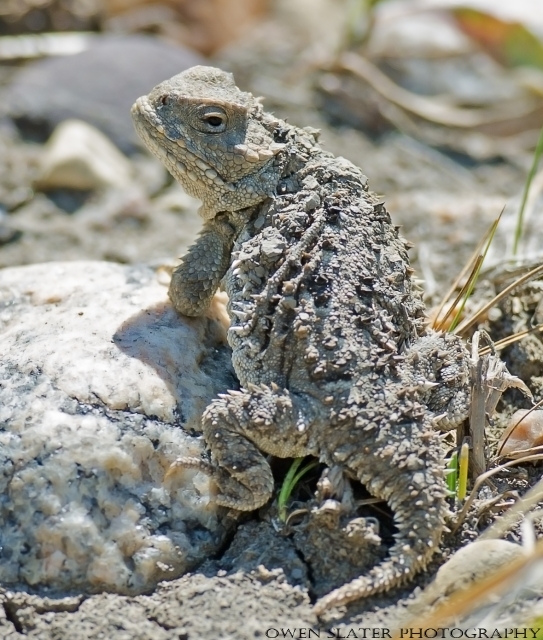 A grand total of 7 native species of lizard live in Canada so while we won’t win any lizard biodiversity awards we at least have a few hardy species that deserve respect for being able to survive here. Not only that, but the one I was searching for, the greater short-horned lizard, has the unique ability to shoot blood from its eye! Finding any of these lizards can be challenging at the best of times but compounding things is that this species is a master of camouflage, only a few inches in length and unfortunately, critically endangered due to habitat loss. Never one to be deterred by long odds, I set out to find one. The searching process involved slowly walking along south-facing, rocky hills in a slow and meticulous manner while keeping my eyes fixed on the ground immediately in front of my feet. Only when the lizard is about to be inadvertently stepped on will it bolt from cover. Thankfully, my good luck that week continued and this one scurried from cover shortly after starting the search. They don’t view humans as predators so I didn’t have to worry about getting a squirt of blood in my face while I photographed it! They save that secret weapon for foxes, coyotes and other would be predators. By rapidly increasing the blood pressure around their eyes, it’s believed they rupture a small blood vessel causing blood to shoot as far as 2 meters. The would be predator understandably becomes startled and distracted long enough for the lizard to run for cover, or if it was already picked up, the blood is known to be mildly noxious causing the predator to drop it! If that wasn’t enough they also have the ability to inflate their bodies with air to become a sharp, spiky balloon. With these remarkable and effective survival strategies, all they need from us is to curtail the destruction of their habitat and they should be able to survive for generations to come. The evening before we headed into Grasslands National Park I quickly flipped through a prairie dog book written by one of the leading experts in the field (Dr. John Hoogland), who has been studying them for over 30 years. 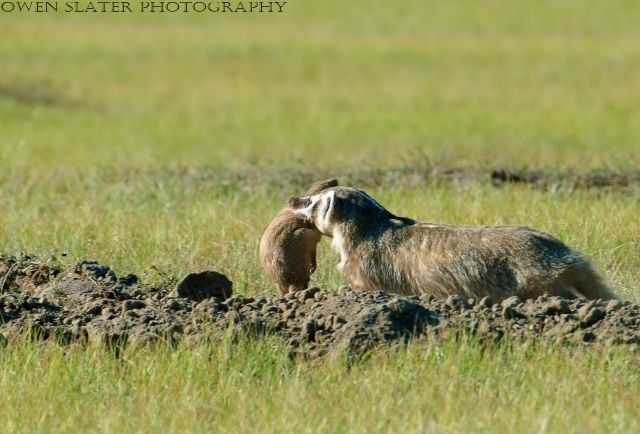 In it he describes that while prairie dogs are known to routinely get eaten by a whole host of different predators it is extremely rare to witness a predation event. In fact, his team has only seen about a dozen in the 30 year period! Having seen neither of these species before, would it be too much to ask to see something like this on my first day? I didn’t think so! 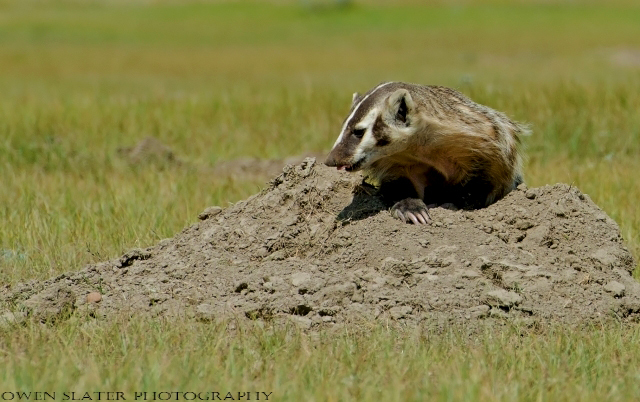 So with this little tidbit of information in my head I didn’t get too excited when I saw this badger eying up a prairie dog burrow. I was happy enough to just see her and her daughter pop their heads out above ground from time to time. But as time went on and they continued to work in tandem to isolate a series of prairie dog burrows my thoughts started to shift. Maybe today I was going to get a chance to see something pretty rare? The badgers certainly seemed determined. They continued to dig under the hot, mid-day sun. One stayed down in a prairie dog burrow they were excavating while the other worked to prevent any backdoor escapes by plugging the adjoining burrows with dirt. Taking turns they alternated between underground digging and above ground burrow patrol making sure that all the other burrows remained packed down and listening for any sounds of the prairie dogs beneath them. When the mom was out doing her patrols she suddenly changed from relaxed to on high alert. She must have heard the muffled sounds of a prairie dog barking out alarm calls because she focused all of her attention on the ground next to one of the plugged burrows. She carefully moved around the mound and stood motionless for several seconds before gently scratching at the ground with her back foot. She did this for a few seconds and then cocked her head and listened for a response. This was repeated several times and I suspect it was used to pinpoint the location of the prairie dog. 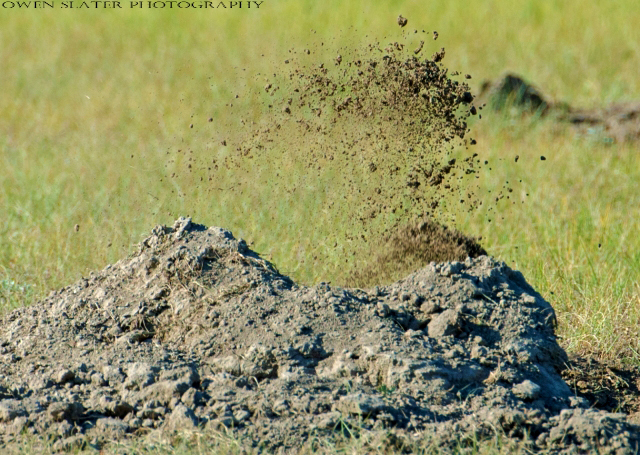 Once she determined it was within range she launched herself at the entrance, flinging dirt into the air at an almost unbelievable rate as she quickly closed the gap on her prey. After about 30 seconds the dirt stopped flying and there was a pause in the action. In my mind I figured she had caught a prairie dog and was likely eating it within the burrow. After all, I knew that the odds of actually seeing a predation event were slim to none! With these thoughts going through my head I started to relax my grip on the shutter release and I started readjusting the settings on my camera. I should have been more patient because as soon as I lost my focus she came bolting out of the burrow with a prairie dog clenched in her jaws! I fumbled with my camera as she started running towards the open burrow 15 feet away! I knew I had less than a few seconds to get a photo and I madly tracked her with my camera, firing off frame after frame before she disappeared out of sight. Thankfully she gave me just enough time to get the photo below! I sat in the car dumbfounded with what I had just witnessed. I scrolled through the images checking to make sure I had captured a bit of the action but I didn’t have much time to rest. 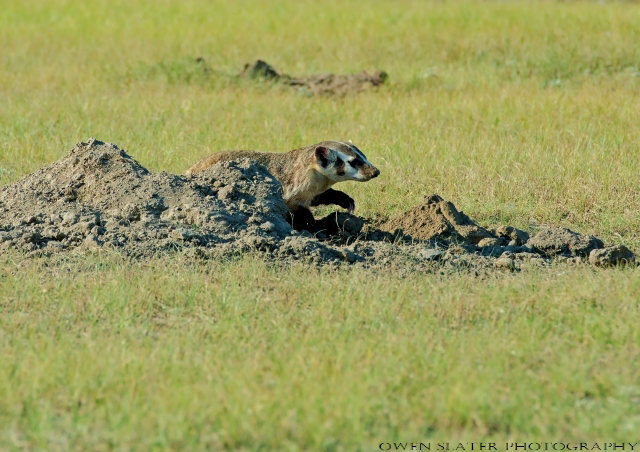 Within a few minutes the mom was back out and heading towards the burrow she had just pulled the prairie dog from. She briefly stopped to look in my direction, which was when I noticed the blood tinged right ear. She also had a cut on one of her toes so the prairie dog must have put up a bit of a fight. In the end it was no match for the badger duo. She repacked the burrow with dirt to prevent any remaining prairie dogs from escaping and rejoined her daughter for dinner. Over the next few hours the badgers ate their hard fought meal in the confines of the burrow. It wasn’t until they had finished that they both emerged and relaxed at the entrance. Luck continued to be on my side and for the next three days they made this burrow their temporary home. Each night they would emerge to play with one another and go on hunting expeditions but I never saw another successful hunt. I guess I shouldn’t have expected to but it was hard not to have increased expectations after a first encounter like this one! 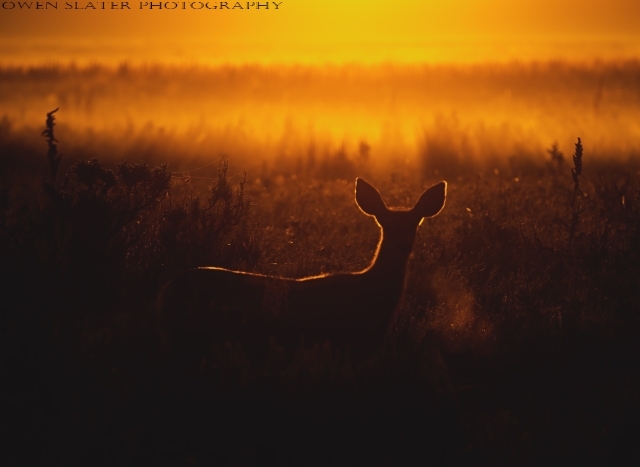 A mule deer exhales as the sun’s rays highlight its frame in beautiful golden light on another spectacular morning in Grasslands National Park. I went to prairies with the goal of seeing and photographing animals I had never seen in the wild before. 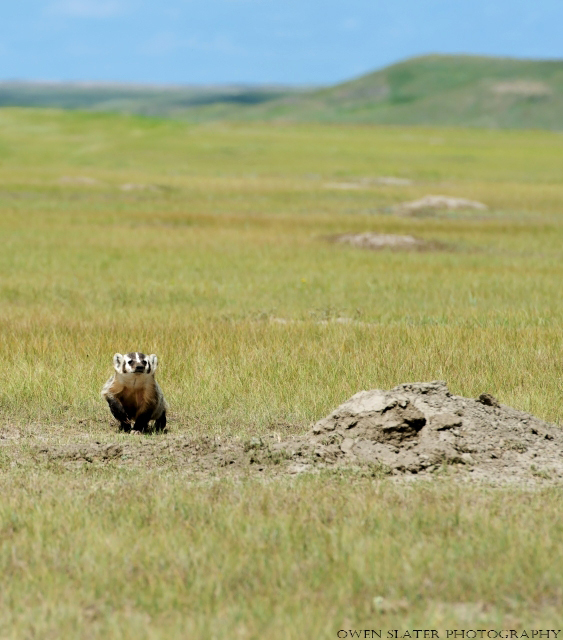 The list was longer than I care to admit but included burrowing owls, prairie dogs and badgers. While I knew the first two would be very easy to find, badgers were suppose to be a bit harder. Little did I know in grand fashion I would check all three off the list in one morning! The first part of the morning we were treated to a beautiful sunrise while photographing a great horned owl, burrowing owls and later on prairie dogs as they woke up and left their burrows to eat. By about 11am we decided to drive down the road to see some other sights but we didn’t get far. 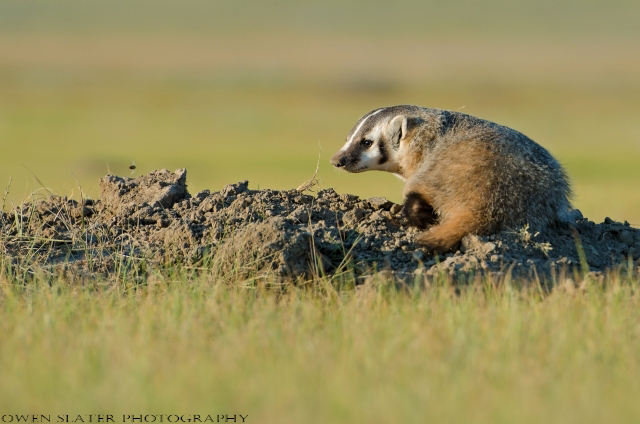 Within about 15 minutes we pulled into a parking area next to a prairie dog colony and lo and behold a badger was resting at the entrance of a burrow!! 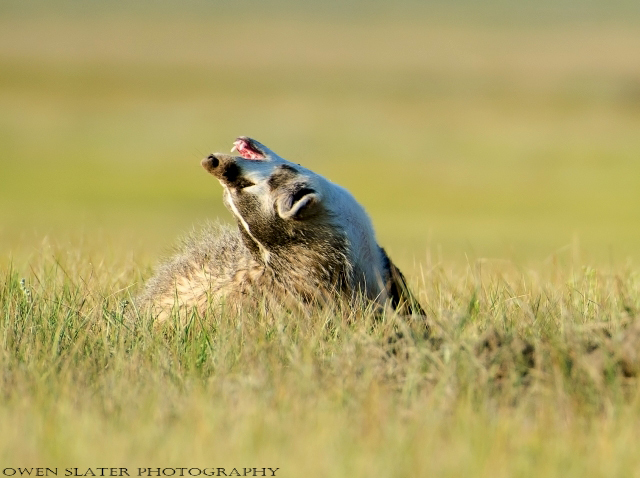 Over the next several hours we were treated to amazing scenes of a badger mom and her daughter that included them hunting prairie dogs in broad daylight! But that story and the accompanying photos are for a different post! This is merely an introduction! Here the daughter looks around her surroundings after helping to excavate a prairie dog burrow. A true sign that she was not the least bit concerned about me and my clicking camera was when she started to play right in front of me! She rolled around in the grass, jumped up in the air and snapped at invisible objects! At one point she circled around the burrow and came within 10 feet of me before getting distracted by a leopard frog that leaped out in front of her. She briefly chased after it before the next distraction happened; a prairie dog not too far away. With her tail raised up in the air she sprinted off towards it as it squeaked an alarm call and vanished down the burrow. 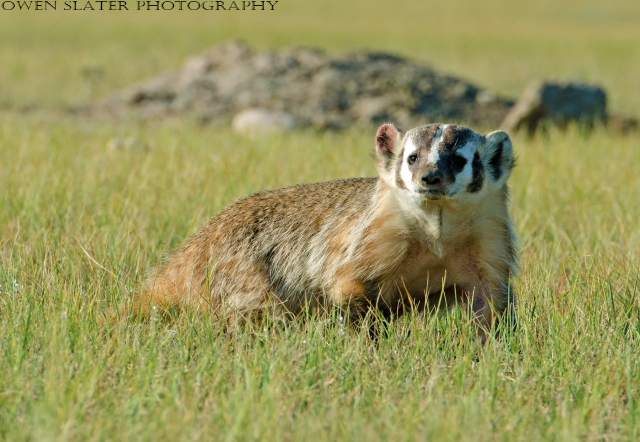 This is just the tip of the iceberg of the badger extravaganza that day, so stay tuned for more including the story and rarely seen photos of them hunting prairie dogs!